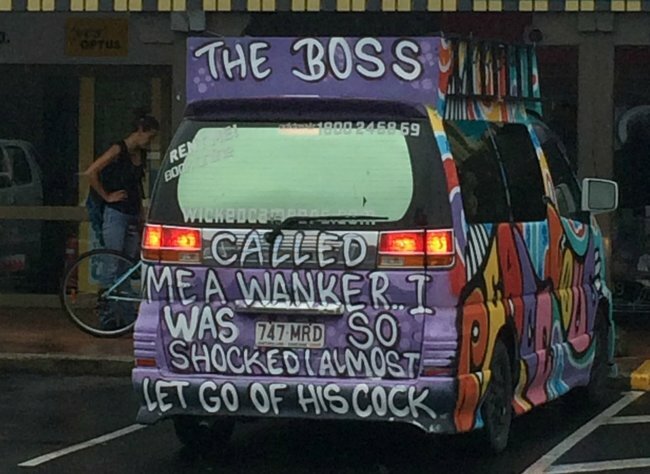 Wicked campers' offensive slogans have not disappeared. You're in a car park. Kids are everywhere. 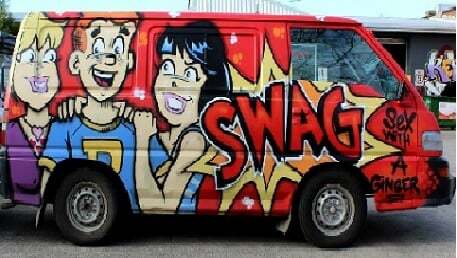 Is this okay? It’s Boxing Day. Mamamia’s publisher Mia Freedman is with her kids in a Woolies carpark in a busy coastal holiday town loading groceries into her car. This is what she sees. In what civilised society is that OK? If it were a billboard – which is absolutely is – it would be illegal. If it were an advertisement – which is it – it would be banned. In no way could this pass any public decency test. 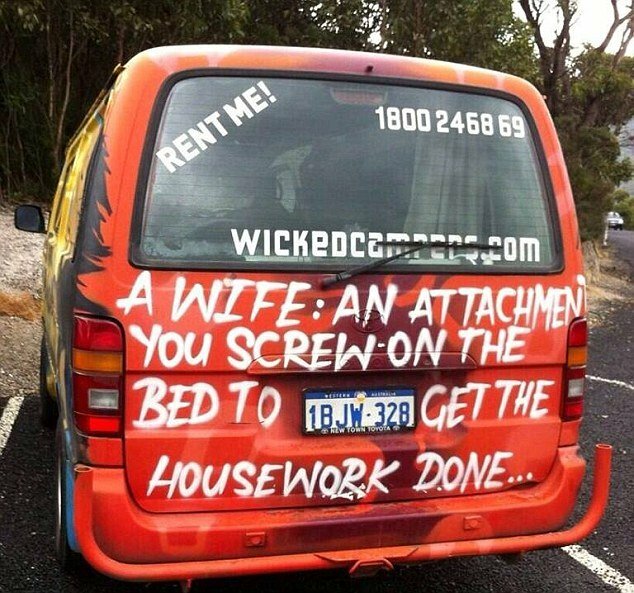 And yet the gutter-dwelling company that is Wicked Camper Vans are still somehow able to legally rent out their offensive, appalling vehicles, plastered with these vile slogans. But wait. 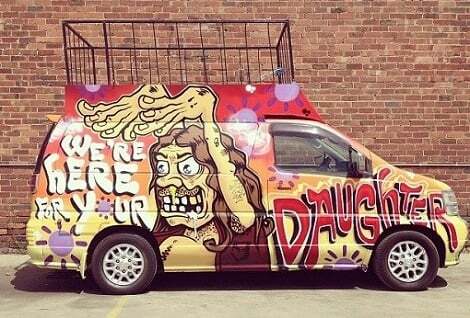 This fleet of disgustingly-decorated, cheapo vans are not supposed to be polluting our eyeballs any more. 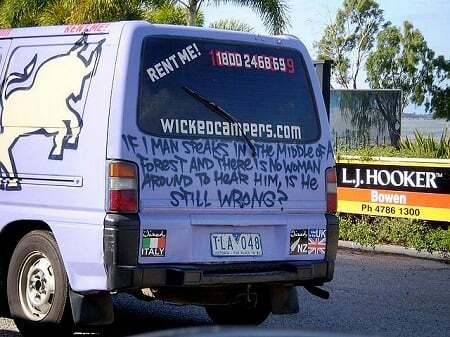 The vile van slogan that sparked a storm back in July. In July this year, this picture was widely circulated on social media after a mother found herself driving behind it while her children were in the car. 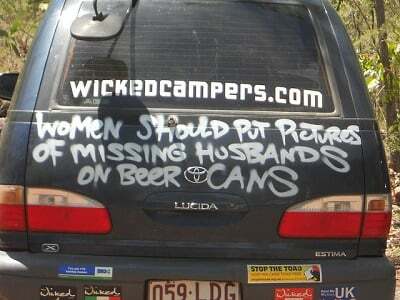 Her complaint and campaign sparked a media storm and a petition on change.org was created to put pressure on Wicked to get rid of their ridiculous slogans.The campaign attracted more than 127,000 supporters and was widely declared a victory. 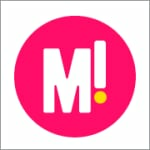 We’ve just won! 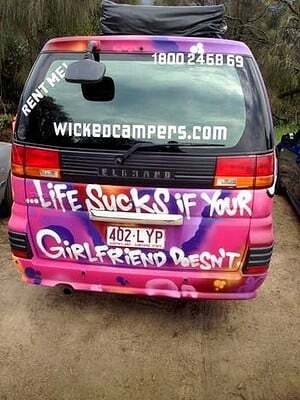 Wicked Campers have apologised, and committed to removing all misogynistic slogans from their vans within six months. Nothing has shifted them in the past. Complaints. Fines. 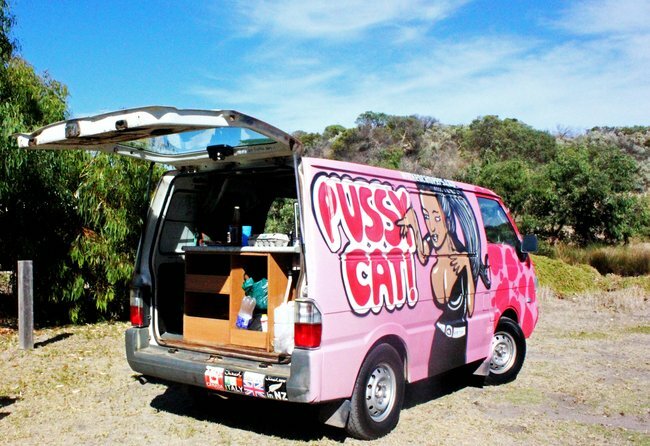 But after initially responding to the petition saying they “didn’t care about the uproar” – after your massive support for my petition, they’ve apologised and will re-spray the offensive, sexist vans. This was a people power win. 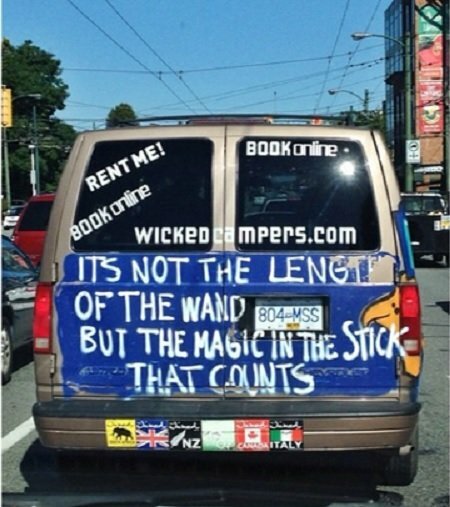 So what’s the story, Wicked? 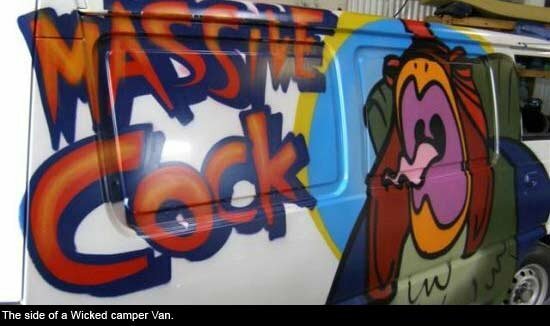 There’s no excuse for these vans to still be on the road five-and-a-half months later. 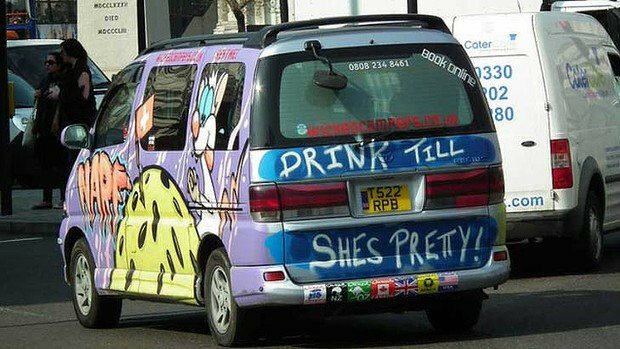 You pledged to respray them and you have not. 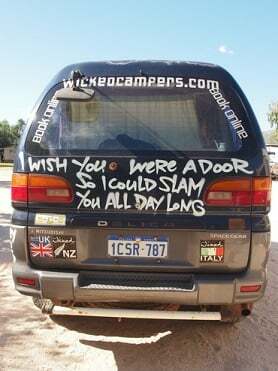 Leave a message on Wicked Campervans’ Facebook page. 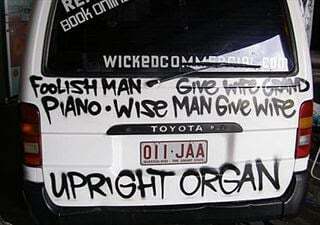 And complain to the Advertising Standards Bureau. 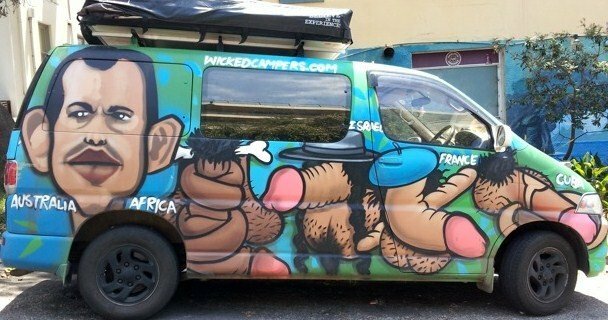 These vans are often the first thing that visitors to our country see. 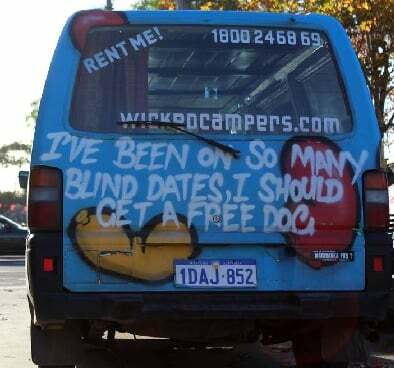 Wicked’s target market is backpackers. But it’s not who this country is. It’s not who we are. And it’s not something we should have to look at when. Are you offended by these slogans? What do you tell your kids about them?